They have been broken up into two parts due to the limit allowed on pictures per posting. I will possibly make better versions of each uniform on a better template eventually, but for now I've just finalized the ideas of my designs and I'm looking for feedback. A description of each jersey is at the bottom of the page. Using the Wikipedia template, I tried to keep all the jerseys as close to the way they look as possible and if anything enhance them or remove elements that I felt weren't necessary or I just didn't like. 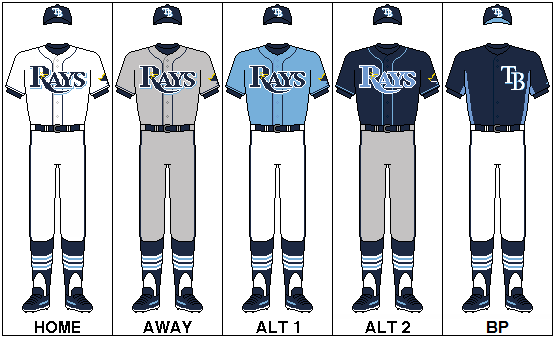 Also I've included BP jerseys with each of the uniform sets, as well as a few throwbacks. The BP jerseys are made to more resemble the previous version the MLB wore prior to the kind they wear now. As an added touch, I've given all the teams traditional style stirrup socks and I've cleaned up the colors on the shoes a little bit too. Here's each team in alphabetical order. For the Orioles I pretty much kept them exactly as they were. The home and road jerseys are identical except for the hats. I never have liked the cartoon face oriole logo so I replaced it with the 90's/00's era bird logo. For the alternate orange jesrey I added white and black trim to the sleeve cuffs, while I turned the black alternate into the BP jersey and gave the BP hat the "O's" logo. 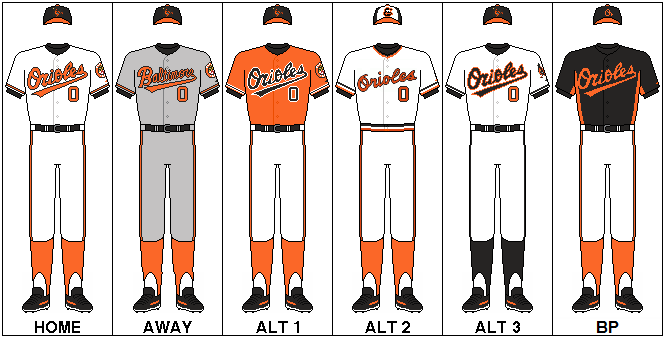 For all the jerseys I kept the stirrups a more consistent orange. I added two throwback jerseys, one the early 80's version complete with beltless, elastic waistband pants and the mid 90's version with black script lettering and stirrups. I'll keep my opinions of what I think about the Red Sox as a team to myself thank you. What I will say is that they have another traditional iconic uniform that has stood the test of time. Seeing as there wasn't much to do with it I left both the home and road jerseys pretty much the same but did add the same red piping from the home jersey to the road jersey and gave both red trim to the sleeves. I also added the red sock logo from the road jersey sleeve to the sleeve of the home jersey. (Why they don't already have it on both doesn't seem to make sense to me.) 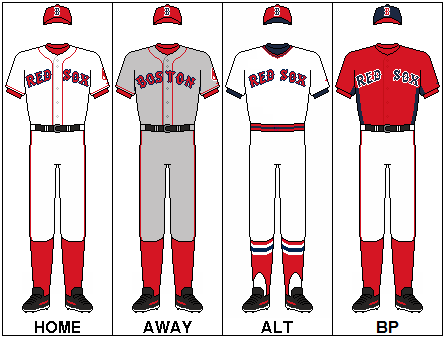 I never really have liked the Red Sox in alternate red or blue jerseys as it just doesn't seem right, so I made a 70's throwback jersey as an alternate instead. What really doesn't make sense to me about the Sox is why after 80+ years they have always worn NAVY BLUE hats of all things! Honestly, for a team called the RED Sox, why would you not wear RED hats??? (Or at least have a red bill with them.) Taking that into consideration I gave them red hats both at home and on the road, much like they had for a brief period in the 70's. I made the socks solid as opposed to stirrups as it just makes sense to have regular socks for a team named after socks. Finally, the BP jersey is very similar to what they have now as just a solid red and the BP hat is also pretty much the same with a red bill. Overall these color combinations and adjustments just make way more sense to me for a team with a name and logo as they do. Don't go railing on to me Sox fans about tradition and all that crap because as a Cards fan I know all about tradition and my thoughts are exactly the same with my own team's colors. That's just my opinion and you don't have to agree with it. 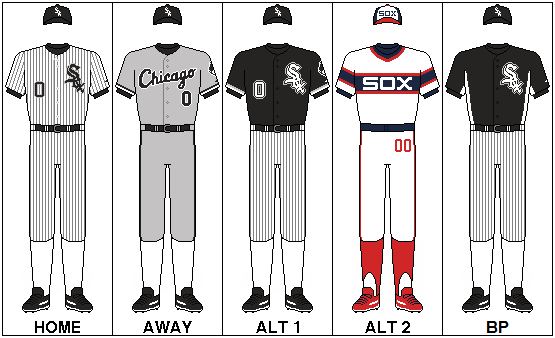 Yet another team that has a traditionally solid uniform and really sharp logo is the White Sox. I pretty much left them 98% the same with the only adjustments being changing the socks white to actually fit with the team name. Again, just like the Red Sox hats, why a team called the WHITE Sox would wear BLACK socks is beyond me. I have always loved the Sox alternate black jersey as I feel it fits in with their color scheme, so I left it alone and copied it for the BP jersey. (Minus the white sleeve cuffs.) Also not liking white bills on the hats or vice-versa, I left the BP hat fully black. I also made a modification to the throwback jersey by changing the pants to the appropriate beltless type with an elastic waistband. Also I dropped the sleeve patch so that there wasn't any particular year represented and they just appear early 80's. I am not someone who is offended by the Indians Chief Wahoo logo, however I do also love the block letter "C" they brought back a few years ago. The Indians have always had a great color scheme but recently I feel have done a little too much with their uniforms. Starting with the home white jersey, I returned them to the late 90's look by bringing back the red piping and sleeve trim. I preferred the road jerseys with the name "Cleveland" in the same matching cursive font as the home jersey, but the block letters are also a good old fashioned look. However I do feel that it makes the jersey seem a little too plain, so I gave them the same blue piping and sleeve trim from the 90's, as well as a white outline around the "C" logo on the hat to make it standout better. 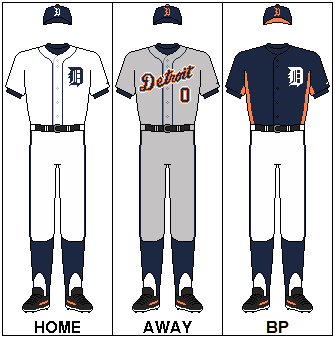 Along with the alternate blue home jersey I made one for the road and gave both the same grey piping and sleeve trim. I don't really care for the cream alternate jersey with "Indians" in block lettering so in it's place I made a pair of throwbacks. One a red mid 70's version and the other a late 80's version as seen in the movie "Major League." (It just seems appropriate that the Tribe should wear these as alternates.) Finally the BP jersey is made to also resemble the 80's BP jerseys with Chief Wahoo on the front and the BP cap is made to look like the hats from the early 80's. Absolutely nothing I felt was needed to be done to the Tigers jerseys in anyway whatsoever, as they are another one of the most iconic and traditional looking jerseys in the league, nor did I feel there was any need for an alternate. I did make the BP jersey to fit in with the same design I've been using and gave the BP hat an orange bill. What's not to love about the Astros new/old look? A much better and more traditional approach in my mind going back to the original color scheme and design. The style appears to be a much more southwestern, Texas looking theme as opposed to their previous style. As far as the uniforms themselves, there really wasn't much I felt needed to be done to the regular home and away jerseys other than tweaking the hats. I thought the home jersey would look better with the alternate orange hat and the road jersey in the solid blue hat, so I made the current road hat into the BP cap as I really don't like the one they have now. I modified the lettering on the orange alternate jersey by making it white with a blue outline as I feel it stands out better this way. I also added a blue road alternate jersey with similar lettering and piping.The most obvious addition is the "rainbow gut" striped jersey from the 70's as a throwback. The design is copied as identically, including the white shoes. Also I added the short lived late 90's jersey as a throwback, a design that I always loved. Finally the BP jersey has been left the same, except for the change to the hat of course. The Royals have had a very consistant and simple look for the most part of their history and again I felt there wasn't anything necessary to do to their regular home and road jerseys. I kept the alternate blue jersey but I never have liked the Royals in powder blue, so I dropped those alternate jerseys and hats. 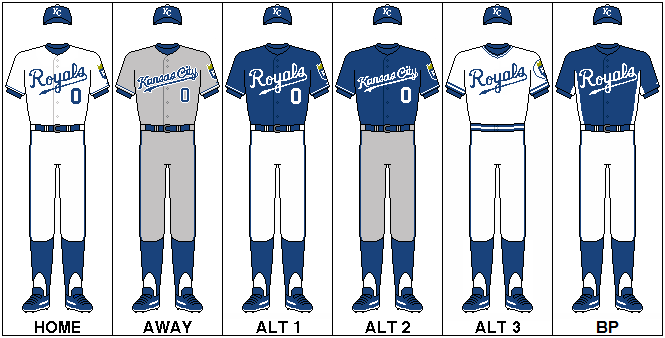 Instead I made a royal blue alternate version of the road jersey and as well as a 70's/80's throwback. The BP jersey is a darkened version of what they have now and not liking the white BP hats I made them solid blue. Personally, I preferred it when the Angels called themselves the California Angels as opposed to LA or Anaheim. It sounded better and it was easier to distinguish them. Plus, it gave them a unique personality as one of just a few teams to designate their home as an entire state as opposed to a city. Still, I like their colors and traditional look they've kept (in recent years anyway) to their uniforms. The regular home and road jerseys I tweaked a little by adding piping and leg stripes to each, as well as the same type of sleeve stripes from the alternate red jersey. 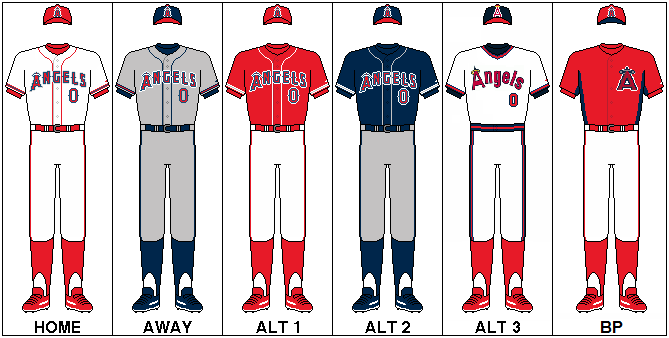 In addition, I added a blue alternate road jersey and made the road hats blue with a red bill, very similar to the original style Angels caps. A 70's/80's throwback was also thrown in to the mix, and the BP jersey was left pretty much the same but I made the BP hat red with a blue bill. The Twins are yet another team with a traditionally classic look that have done well to keep it that way. Over the years we've seen a few different looks, but up until now I've always like their uniforms. I don't know why they ever thought of adding gold to their color scheme as they have done recently and personally I think it looks terrible, so I returned their regular home jersey to the previous classic pinstripe look that they had and kept the regular road jersey also the same as it's most previous version. The blue alternates are like what they also had and correspond to both home and road. The 60's throwbacks are still a great look and I've also added a 70's/early 80's era throwback jersey as well. For the BP jersey I made them with the "M" logo on it as I think it's a logo that isn't utilized as much as it should and, made the BP hat blue with red bill. A final touch is the same sleeve patch from the regular home jersey on the alternates and regular road jersey. You'll notice I left out the Yankees, mainly because the Wikipedia template of theirs doesn't match all the others for some reason, but also because seeing as the Yanks are practically the most iconic traditional of any jersey in the league, I felt that there was absolutely nothing that needed to be done with them. The A's have always had a great look, both color scheme and uniform design. Every era of it has been a very sharp, very classic look, and it's good to see them sticking with tradition too. Thus being the case, I left the regular home and road jerseys alone but made the standard hat green with a yellow bill for every single jersey. I just don't like the solid green colored one and the original green and yellow hat just seems to fit so much better with the look of every kind of jersey. In addition to the already existing yellow and green alternate jerseys, I made a white version of it with green "A's" logo, piping and sleeve trim. Also I added a 70's throwback jersey as well. For BP, I kept it simple and made it just plain green with the same logo from the green alternate jersey and also made the BP hat the same as the rest, as opposed to the current one with the balancing elephant, a logo that looks OK I think on the sleeve, but not on a hat. 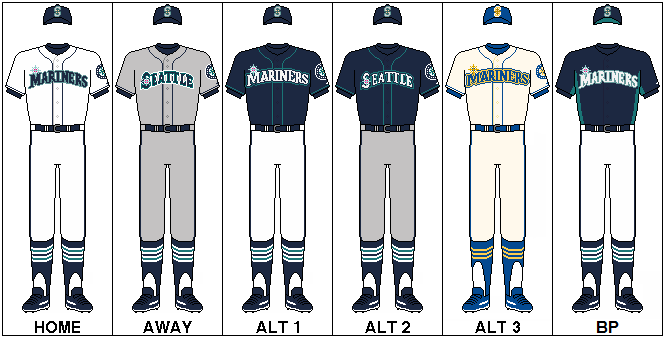 The Mariners current look is one that I like so much better than anything they've had before it. The yellow and blue racing stripes of the 80's were hideous in my opinion, and I never really have liked the same colors as their primary scheme in the 90's either, but the fauxback does work well for reflecting that era. Mainly I left both the regular home and road jerseys as well as the blue alternate jerseys alone but added a simple sleeve trim that matches the piping of each jersey. I never have liked the M's alternate emerald green jerseys. I know it represents the nickname of their city, but it's just another one of those colors I don't think looks good on an MLB jersey, so I dropped them. The BP jerseys are very similar to what they wear now with just a few color rearrangements and the BP hat has the light green coloring. The Rays are a team that I also felt needed practically no adjustments. The only thing I did do was change the colors of the lettering on the alternate blue jersey to a lighter, more legible powder blue. Also I made the BP jersey with the "TB" logo on it and the same logo on the BP hat, as the sunshine ray logo is another one of those logos that just doesn't look good by itself on a hat. The Rangers are a team that has a good color scheme but have made a dumb decision as far as their uniform design goes. Overall I've liked just about every era of Rangers jerseys and the current one is OK, but the part that bothers me is that they say "Texas" both on the road AND at home. I guess it's because Texans are always a bit too full of themselves and having the state name on all of their jerseys is a mere reflection of it. As I've said about some other teams, home jerseys should only have the name of the team written on them and if you're going to put the city or state you're from on a jersey, it only makes sense to have it on the road. Taking this into consideration I returned the word "Rangers" to the regular home jerseys and also gave them the red trim from the late 90's that I thought was very sharp. The road gray jerseys match this with blue trim. I designated the red alternate jersey for home and gave it the appropriate "Rangers" lettering and made the blue alternate jersey strictly for the road. Two throwbacks are added, one being the original jersey worn in the 70's and the other the early 90's version, both my two favorites of the Rangers. Finally for the BP jersey I put the "T" logo with the Texas flag in front of it found on the current BP hats on the jersey and instead left the hat logo alone as the regular "T" logo. The Blue Jays have a very pleasant color scheme and very clean, traditional look. Another team that was smart and went back to it's classic uniforms. I love everything about them. Nothing to change on here at all. The only additions are an alternate road jersey and a pair of 70's/80's throwbacks similar to the one they wore a few years back. The BP jersey is almost identical to the current ones but the BP hat has just the regular Jays logo as I feel that the Canadian maple leaf doesn't really represent the team as much as it does the whole country, and it doesn't make the hats recognizable to the casual observer. Well that's it! Thanks for reading and thanks for looking. I look forward to hearing what you all think! I'm open to any advice and constructive criticism. Please note that I'm entitled to my opinions as you are to yours, so please don't take offense at any of my thoughts or reasons for doing work on a particular team's jersey. That's just what I think and you don't have to agree with it. Be sure to check out my NL uniforms adjustments and concepts page if you haven't yet! (http://boards.sports...ncepts-updated/) Thanks everybody and hope most of you like the designs! The "gold" is really more a "sand" color, and was added as an accent. The reason the Twins chose it was to recognize/tribute the color of the limestone of the ballpark. That stone was excavated from the Minnesota River Valley -- it's quite prevalent in architecture in southern Minnesota. I don't know if that's ENOUGH of a reason to add it to the official palette, but it is what it is. Very interesting, thanks! Never knew that. Yeah, that might be an interesting enough reason, but I really don't think it looks good on their jerseys. To me, I always came to identify the Twins with the pinstripes and it's just such a classic look. (Of course, other teams have made worse decisions as far as color choices go than others.) If anything, maybe it would have worked better as just an alternate. Great work, Astros look the best. Thanks! I'm surprised how many people really like those old 70's Astros jerseys. I don't think they're ugly compared to some of the other threads teams were wearin' at the time. I actually love 'em from a nostalgic standpoint, but it's definitely something you couldn't get away with today. Yeah, I was actually starting to think that some jerseys are looking a bit generic now-a-days with so much of the same dark colors as alternates. It's one thing to have the same color as another team, but I think what sets teams apart better is the shade of those colors and what they do with the jerseys to keep them from being too plain or boring. (That's part of why I did my concepts was to address this problem.) If anything, the pullover days of the 70's & 80's were a bit more fun as far as jerseys go. Some may have been loud and a little too flashy, but there was a lot more creativity as far as what teams did with their jerseys, for instance the different sleeve, collar, and waistband stripes, etc. The Astros should go back to the NL so each league has a Texas team, they should switch with the Brewers who were originally an AL team.